We are pleased to announce the release of Analytics Canvas Version 3.1, featuring the Google Analytics Reporting API v4 and enhancements to our Data Studio community connector. Canvas is well known amongst Google Analytics professionals for how robust our GA connector is. With the Reporting API V4 we've taken things to a whole new level! Nobody likes a sampled dataset. 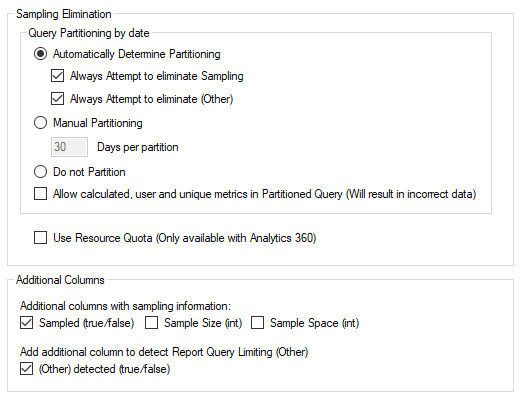 With the Analytics Reporting API v4, if Canvas finds sampling in your dataset, it will attempt to eliminate that sampling programatically by partitioning the query or, with your permission, using your Resource Quota (for Analytics 360 accounts). If you've ever found a row in your dataset where all dimension values are "(other)", you've encountered Report Query Limiting. This happens when you have a high cardinality dimension, such as a dynamically generated PagePath. While there are slightly higher limits for Analytics360 customers, they are not immune from these limits. The good news is that Canvas will automatically detect and attempt to eliminate this form of sampling as well. Since some requests can be computationally complex, each Analytics 360 property is assigned a set amount of 'query resource tokens' each day. This new system of using a resource based quota is designed to support a higher threshold of sampling while still using the Analytics Reporting API. These tokens can be used to request up to 100M sessions of unsampled data per day, without having to use BigQuery or the Unsampled Reports API (although both of those are available in Canvas for those with larger, more complex queries). Google has increased the limits on the number of rows returned per API call. You can now get up to 100K rows per API call with the Analytics Reporting API, vs just 10K rows per API call with the Core Reporting API. This is ideal for those concerned about exhausting their daily API quota of 10,000 API calls per day, which remains unchanged. Since launching our Data Studio Community Connector nearly one year ago, our customers have been using Canvas to clean, prep and blend data sets together for their Data Studio reports. As Data Studio usage grows, the team at Google has been working hard to bring new features and functionality to their users, averaging 3 new updates per month in the last year! improved data type detection in Data Studio. Dates will appear as dates, booleans as booleans, etc. Learn more about getting your data prepared and published into Google Data Studio using Canvas. If you’re new to Analytics Canvas, sign-up to get your unlimited, full featured, 30 day free trial. You can pull hundreds of millions of rows of unsampled data, process it, and cruise through that data in Data Studio - no credit card, no sales call required! We’re here to help you get started with Canvas or with any of the new features. Email support@analyticscanvas.com with your questions or use our meeting-planner to book a call.